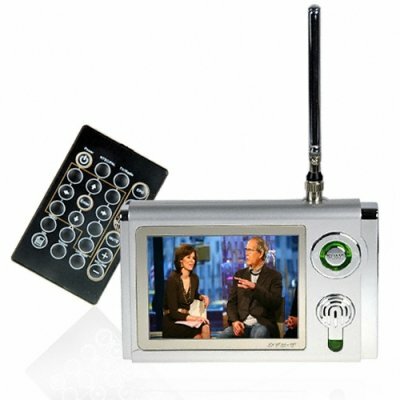 Successfully Added Portable DVB-T Receiver Set - 3.5 Inch DTV to your Shopping Cart. Digital TV player with a beautiful 3.5 inch TFT screen for taking DVB-T programs with you wherever you go. People always on the go know the value of a mini-TV that can travel with them, but with the demise of analog TV, finding a mobile solution to satisfy their needs has been tough. With this completely mobile DTV set though, now you can travel through many areas of the EU and get crystal clear reception. Backpackers will love dual antenna design; one antenna is perfect for reception while walking while the other antenna is perfect for when stationary (like at a hostel or sitting train). Other excellent features include an AV out port for connecting to a larger LCD screen and sharing the digital love with your friends, your choice of listening via a very loud 1.8W speaker or privacy via the 3.5mm headphone/earphone jack, and a super long lasting 2250mAh Li-ion battery. Never leave your TV behind again, and join the digital world of entertainment now with this Chinavasion wholesale DTV product with no M.O.Q. (no minimum order quantity) and direct to you low wholesale price for our re-sale customers.